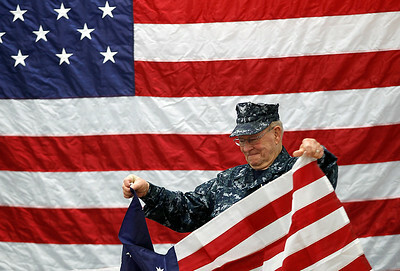 Matthew Apgar - mapgar@shawmedia.com Lake In The Hills American Legion post 1231 member John White folds an old American flag in front of a much larger current version of the flag during a presentation about its history, evolution, and etiquette for fifth grade students at Eastview Elementary School on Thursday, May 07, 2015 in Algonquin. Matthew Apgar - mapgar@shawmedia.com Lake In The Hills American Legion post 1231 members Jim Mertz, left, and John White, center, help Eastview Elementary School fifth grade students Aaron Preston, center, and Teagan Krajenta, right, properly fold an American flag during a presentation at the school on Thursday, May 07, 2015 in Algonquin. 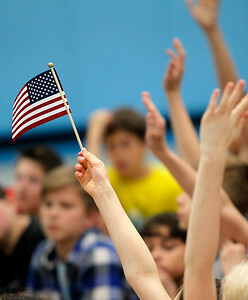 Matthew Apgar - mapgar@shawmedia.com Kyra Gallagher raises a small flag as she and other students look to get called on to answer a question from Lake In The Hills American Legion Post 1231 members Jim Mertz and John White (not pictured) during a presentation for fifth grade students about the history, evolution, and etiquette of the American flag on Thursday, May 07, 2015 at Eastview Elementary School in Algonquin. 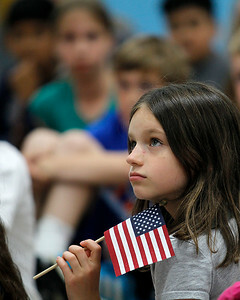 Matthew Apgar - mapgar@shawmedia.com Kyra Gallagher holds a small flag near her head as she listens to Lake In The Hills American Legion Post 1231 members Jim Mertz and John White (not pictured) during a presentation for fifth grade students about the history, evolution, and etiquette of the American flag on Thursday, May 07, 2015 at Eastview Elementary School in Algonquin. 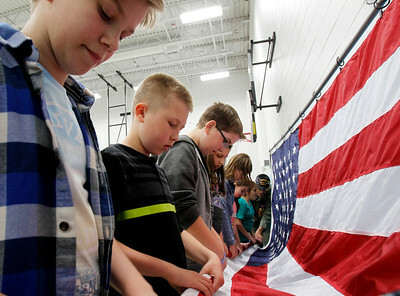 Matthew Apgar - mapgar@shawmedia.com Eastview Elementary fifth grade students (from left): Jacob Jamrozik, Ryan Holmer, Gehrig Auer, Claudia Gawron, Erin Aagaard, Abigail Dobrescu, Brooke Dobson, and Daniella Rico roll a large American flag with help from Lake In The Hills American Legion Post 1231 members Jim Mertz, back, and John White, not pictured, during a presentation for fifth grade students about the history, evolution, and etiquette of the American flag on Thursday, May 07, 2015 at Eastview Elementary School in Algonquin. 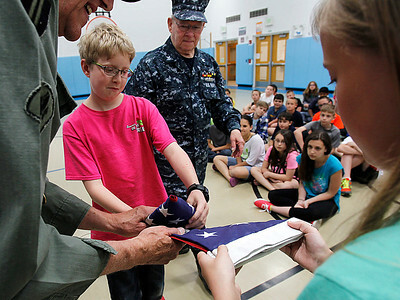 Lake In The Hills American Legion post 1231 members Jim Mertz, left, and John White, center, help Eastview Elementary School fifth grade students Aaron Preston, center, and Teagan Krajenta, right, properly fold an American flag during a presentation at the school on Thursday, May 07, 2015 in Algonquin.